Java is a general purpose high-level programming language based on the concepts of object oriented programming (OOP) which derived much of the syntax from C and C++. It’s specially designed to have fewer implementation dependencies compared to its previous versions. It’s a computational platform for developing application software developed by Sun Microsystems, which was later acquired by the technology giant Oracle Corporation. Core Java is never actually defined anywhere and is just a term used by Sun Microsystems to better describe the Java Standard Edition (Java SE). This is the most basic and robust version of Java which consists of a wide variety of both general purpose and special purpose API’s. The reason it’s called the standard edition because it gave birth to all other editions of Java. Java is hypothetically everywhere, thanks to its readability and simplicity. From mobile applications to websites, game consoles to datacenters, from mobile phones to the Internet, Java is everywhere. Millions of devices throughout the world use Java as a core programming language. Even all native Android apps come built-in with Java and several companies use Java as server-side scripting language for backend development. Many applications and websites require you to install Java because it’s fast and secure. What started out simply as an Internet language has become one of the most versatile cross-platform programming languages ever developed. The best part it runs on literally any device without the need for recompilation, hence the slogan “Write once, run anywhere”. In technical terms, it’s a high-level programming language that is object-oriented, class based, and is specially designed to have lesser implementation dependencies compared to previous languages. It’s influenced by the V language and much of its syntax is derived from C and C++. 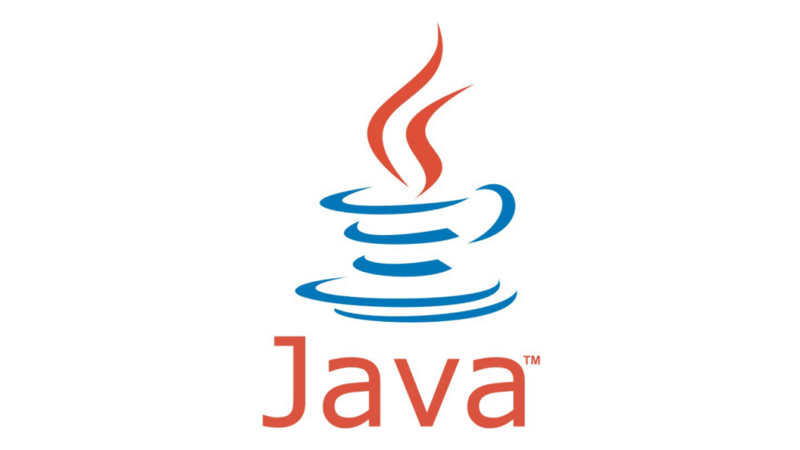 Java applications are typically compiled to bytecode and a class file containing a Java bytecode can be executed on any platform running a Java Virtual Machine (JVM) irrespective of the computer architecture. It’s entirely platform independent which means it can run any compiled code on any platform. The abundance of information and its surging popularity is why programmers and developers prefer Java over other programming languages for development of apps. It’s a general term used by Sun Microsystems to describe the standard version of Java (JSE). It’s the most basic version of Java which sets the foundation for all other editions of Java plus a set of related technologies such as CORBA, Java VM, etc. Core Java refers to a collection of libraries rather than just the programming language. It’s the purest form of Java primarily used for development of general desktop applications. Simply speaking, it refers to the subset of Java SE technologies which consists of both general purpose API’s and special purpose API’s. It provides the core functionality of Java with the deep knowledge of the Java language itself. Core Java is just a part of Java which stands for J2SE containing all the basics of Java including some principles and package details. 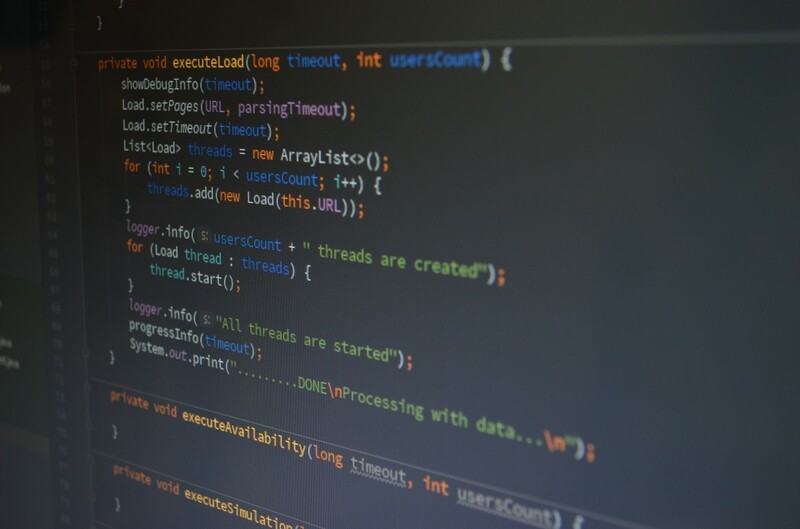 It’s a stand-alone Java application which covers everything from OOP concepts to special operators, from data types to wrapper classes, from Linked list to Array list, and queue to exception handling. There are three computing platforms based on the Java programming language, including the Java SE. It still is the most widely used platform based on the concept of OOP and is commonly used for development of portable desktop applications. In addition to the general purpose API’s, it consists of development tools, a virtual machine, and other class libraries. It also includes the Java Virtual Machine Specification. Java is a general purpose programming language based on the concepts of high-level object-oriented programming language and which derives most of the syntax from C and C++. Core Java, on the other hand, is just a part of Java used for the development of portable code for both desktop applications and server environments. Java is a programming language which supports cross-platform compatibility and is designed to have fewer implementation dependencies as compared to other programming languages. Core Java is a computing platform used for developing Java applications for desktops and servers. Java is robust and secure and platform independent which makes it an ideal choice for development of application software for wide variety of platforms including mobile phones, websites, embedded systems, servers, and more. Core Java refers to the Java Standard Edition (Java SE) which is the basic foundation of the Java platform and is used for the development of enterprise level applications for both desktops and servers. Java is the basic level programming language for beginners wanting to learn the basics of Java programming language and some knowledge of the Java SE. Core Java teaches all the fundamentals of Java applications and more including OOP concepts, Multi-threading, exception handling, Polymorphism, etc. Hypothetically, there’s no difference between the two. Everything is just Java. 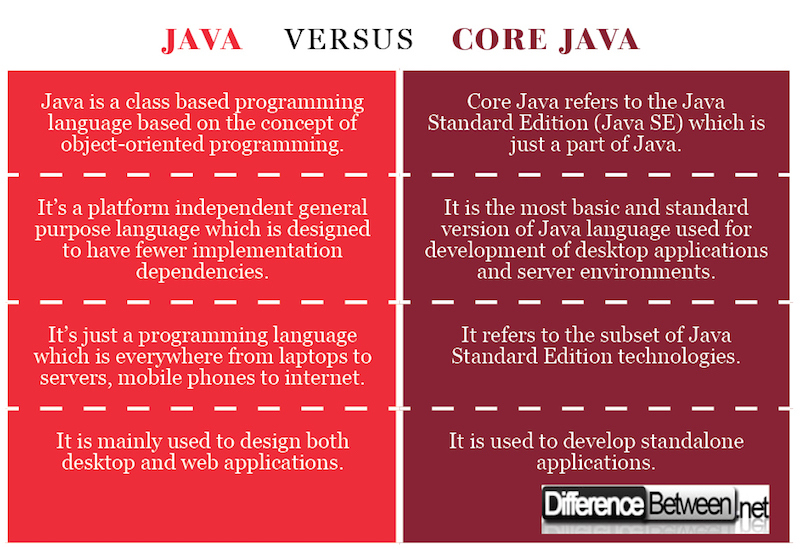 Both the terms are practically same, considering Core Java is just a part of Java which stands for Java Standard Edition plus a set of related technologies. Java is a class based high-level programming language developed by Sun Microsystems, which was later acquired by Oracle Corporation. While Java is used for development of applets and applications, Core Java is mainly used to design application software for both desktop and server environments. Core Java is the most basic and the purest form of Java which set the foundation for other editions of the programming language. Sagar Khillar. "Difference Between Java and Core Java." DifferenceBetween.net. February 20, 2018 < http://www.differencebetween.net/technology/difference-between-java-and-core-java/ >. words it is known to transcoder.